He was the talk of the paddock when we arrived and he has made it official that he is the pace setter by putting his name at the top of the time sheets as 5 days of practice comes to an end and qualifying for the 2008 1:10 200mm World Championships beckons. 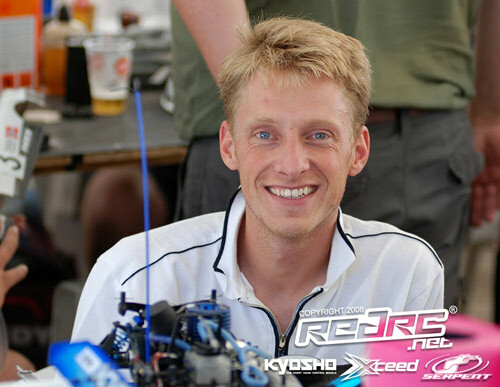 Jilles Groskamp produced the fastest run over 10 minutes in the second of today’s two controlled practice notching up 32 laps in 10:12.223 with his Sirio powered Kyosho. Running a larger head shim for the practice, as Team Sirio played with run time, the Dutch star said the car was not as quick but they had plenty of fuel left after the run and the test would now help them to work out a better compromise between power and consumption. Second fastest on the official time sheets was Daniele Ielasi. Having put his huge 1:8 European Championship disappointment behind him the Italian ace ended up only 3/10th off his Dutch rival. Running his own brand IDM engines Ielasi, who did his fastest time in the morning run, said all is OK with the bumps his only real problem, a common complaint with all the drivers here at the Monsanto track. 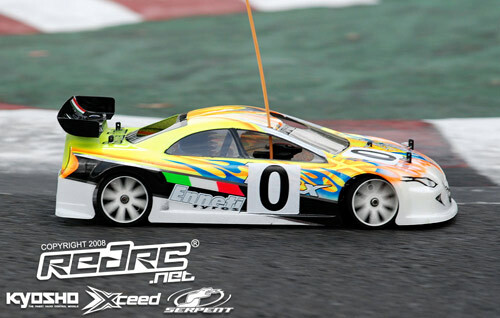 Driving an older Kyosho V-One RRR, the Worlds Warm-up race winner used the second of the days two runs to test a second of his Picco based engines. Niki Duina was very happy with his day as he put his Xray third on the time sheets. The Italian said the track looks easy but to run fast is very difficult due to the bumps as they unsettle the car. Although he would like a little more steering on his Max powered NT1, Duina says he will not make any changes for the first qualifier in the morning which many predict will be the faster of the 2 heats each day due to the cooler conditions. 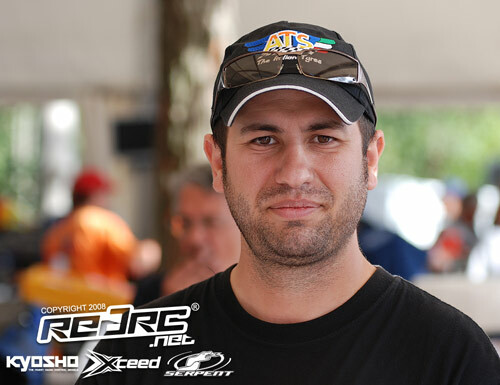 Former double World Champion Adrien Bertin is the leading official factory Kyosho in fourth. The French driver who is also responsible for Team Orion’s engine program said today things turned good for him and he is finally competitive after finding a cure to run time issues which hampered him in earlier practice. As a result of having to focus his main attention on finding the best engine set-up for the controlled Merlin fuel, Bertin says he is struggling a little still with his chassis set-up and needs to find a few more tenths if he is to be on the finals pace. Fastest of the non-Europeans is American electric star Paul Lemieux, the US Electric Touring Car National Champion posting the fifth fastest time ahead of defending World Champion Keisuke Fukuda. Lemieux, who admitted to being a little surprised by how fast the pace was when he first arrived in Portugal, switched to the same set-up as his RC America team-mate Ralph Burch and is now happier with his Xray although he says the car is still very loose on the straight. Although Burch doesn’t feature highly in the timing, the US star is quick around the Lisbon track as is fellow countryman Chris Tosolini. Pleased with how his NT1 is working, Burch said his Max engine was running a little rich and as a result he has failed to complete the full 10-minutes. Tosolini also had fuel issues on his second run while running on the tail of Groskamp. It was a drama filled CP2 for the Kyosho/Sirio driver as on his out lap for the warm-up his car was launched into a roll after hitting one of the bumps at the end of the back straight causing damage which his pitman was luckily able to complete in time for the timed run itself. Defending Champion Fukuda completed the Top 6 but in terms of outright lap times was fastest. Running the new Ninja .12 engine in his Mugen, the Japanese ace was one of the few that didn’t have an issue with the bumpy surface saying it was very similar to tracks in Japan and so for him it was OK. Leading Serpent at the end of practice was their Serpent Driver Development program team member Oscar Cabezas in seventh position. The young Spaniard is complaining of his car being very loose at the rear which means taking big risks every lap especially on the left hand sweeper at the end of the main straight. Cabezas hopes to cure the problem for the morning while his Serpent team-mate Mark Green hopes to cure his lack of steering. The English driver’s 720 is traction rolling not because of high grip but due to the amount of lock he has on his car in an attempt to get it to turn in. Two drivers that are currently running below the radar are reigning European Champion Dario Balestri and fellow Italian Francesco Tironi who according to current pace setter Groskamp are very strong. Tironi says he has resolved his run time problems and will be OK for qualifying. While his Kyosho is sliding around a lot at the end of the straight it feels good on the rest of the track despite the compromised set-up needed to combat the bumps. The 2008 IFMAR 1:10 200mm Onroad World Championships officially opened this evening with the introduction of the complete driver line up and so the stage is now set for a thrilling battle to decide who will take TQ honours as the first of six qualifying rounds, which will be run over the next three days, gets underway here in Portugal at 09:30 local time. 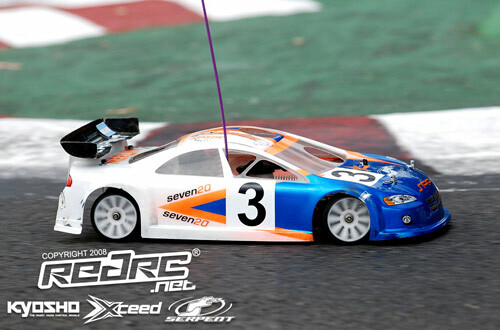 Thanks to our event sponsors Kyosho, Xceed and Serpent we will bring you full coverage througout the day.